The University of Pennsylvania is home to the world’s first and one of the largest student-run hackathons. Over one weekend in early September roughly 1,200 students converged for PennApps. Over 3,000 students had applied to attend. This year, the Wharton Risk Center’s Policy Incubator and the Insurance Information Institute teamed up to sponsor a “hack-for-resilience” route. Students from around the country worked on innovative software and hardware solutions to real-world disaster resilience problems. Projects ranged in platform and application, including elements of web development, mobile applications, drones, and more. In total, 44 teams participated in the hack-for-resilience, developing projects to improve various aspects of disaster preparedness, response, and recovery. Here, we highlight the top 10. Babble is a chat platform that can be installed and used completely offline, providing a reliable form of communication in disaster and other situations where internet infrastructure is damaged, unreliable, or nonexistent. Babble users can connect to nearby devices, creating a localized “mesh network” that allows them to communicate directly with one another. Since Babble can be transferred and installed over NFC by simply tapping two phones together, only a small number of users would be needed to distribute the app throughout a disaster area. Babble not only allows survivors to communicate with loved ones and emergency services (with the network prioritizing the rebroadcast of distress signals), but also provides a platform through which emergency services can provide information and issue public alerts. 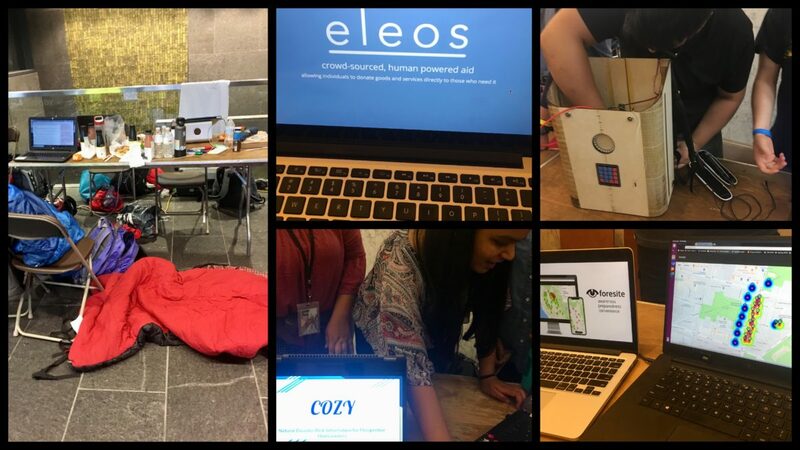 Developed by a student whose hometown was devastated by wildfires in 2017, Eleos is an online platform that allows people to donate goods and services directly to those in need after a natural disaster. Survivors can post their needs to the site. Users can view and search donation requests as well as donations made. The app aims to foster a sense of community by publishing donations and requests to a live board for all users to see. Cozy is a Google Chrome extension that provides property-specific disaster risk information to users when they visit housing websites such as Zillow or Trulia. In the same way that these sites provide information about crime levels and the quality of schools in a given property’s neighborhood, Cozy draws on hazard databases to provide information about the likelihood of various natural hazards (e.g. earthquakes, hurricanes, tornadoes) occurring at a given property. With this information at their fingertips, prospective homebuyers can make more informed decisions about whether to purchase a property, invest in risk reduction measures, and buy disaster insurance. RiskWatch allows users to anonymously report and view potentially dangerous hazards such as fires, floods, or fallen power lines at a given location. Users can report the hazard, classify the level of danger they perceive, and upload images. The developers note that false images could be filtered out by using machine learning. The interface also allows user to identify fire stations nearby and contact local law enforcement and/or fire departments if needed. Drone Swarm uses parallel-processing, data-sharing drones to trace and detect emergencies in dangerous environments. The drones are deployed in hazardous situations such as wildfires or floods to collect data. That data is shared with a central computer and used to better inform navigation and evacuation routes. The information is also plotted visually for users to observe. Epidemic is a web application that uses machine learning and web scraping to identify areas of the U.S. most vulnerable to disease outbreak. The tool maps a proxy for epidemic vulnerability by scraping twitter for propensity of anti-vaccine tweets, categorized by machine learning. These tweets range from pre-scraped past tweets to real-time streaming tweets. It also scrapes flight data to find points of connectivity that can be simulated. The Epidemic website displays a geographic heat map of the US based upon the level of anti-vaccine sentiment and allows users to create a custom heat map and explore different epidemic scenarios. Disaster Alert Box (DAB) is a home automation device that provides information about whether a disaster occurred at a specific property and what level of damage it experienced. The device consists of multiple sensors that can detect flood levels, earth movement, smoke, and other hazard indicators. DAB may be especially useful to homeowners that have evacuated as well as to first responders trying to determine which areas have been most impacted by an event. The Disaster Alert Box has 2 modes, power-on and battery powered. After a disaster occurs and mains power is lost, the box switches to a low power mode which runs off a rechargeable battery connected to a solar panel which provides (intermittent) charging, and sends out a radio signal with the collected data that can be subsequently picked up by drones/helicopters/equipment sent out by rescuers and authorities equipped with RF receivers. PrepChecker is an application that aims to provide disaster preparation information that is tailored to the situation, easy to access, and easy to execute. Users enter relevant information when they sign up for the app, PrepChecker then uses that information to create a customized preparation checklist. It then monitors local forecasts and alerts users of imminent natural disasters by sending them a text message with a link to their checklist. PrepCheck sends users their checklists in sections, organized by priority, to avoid overwhelming the user and to ensure the most important tasks are completed. LifeMesh is a distributed mesh network system that provides a reliable form of communication in disaster situations when normal communication infrastructure breaks down. LifeMesh connects personal devices such as smartphones, laptops, or tablets to other personal devices via multiple Wi-Fi modules that can be deployed to a disaster area. Connected users can send messages to anyone and everyone within the network. This tool would be particularly useful for facilitating communication between survivors and first responders and help to expedite search and rescue and other emergency response operations. Foresite is platform that enables users to report disaster information at a particular location and then shares that information with other users nearby. Users within a certain radius of a report are notified of a potential threat and asked whether they can see it. These users can quickly respond “yes” or “no” when the notification pops up; that information is then stored and mapped on the Foresite web application. As these data points are mapped, users can visualize the extent of the incident. These data can be used in real time to identify safe routes through which first responders or evacuees can navigate. Additionally, when a user submits a report, the application provides situation-relevant information to help them stay safe. More information on all the resilience hacks can be viewed on DevPost.